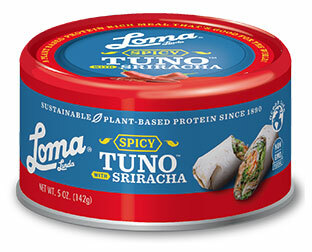 Tuno is back and better than ever with this tasty and flavorful spicy Sriracha version of the classic vegan tuna alternative. All-natural and made from textured soy protein, this awesome tuna alternative is naturally low in calories, carbohydrates and fat, making it a healthy way to enjoy your favorite flavors and textures in a way that's both cruelty-free and good for you, too. Mix it as you would any tuna salad recipe and enjoy the deliciousness of Loma Blue Tuno! BPA-free. 5 oz. (142g) cans are $1.99 each.